Service Hospitality has assembled a working group with a mission to work together to implement best practices and positive change for mental health, safety, and claims management. Meeting three to four times annually alternating between Saskatoon and Regina, we collectively discuss practices and policies and offer training and resources to help members promote employees’ psychological health and prevent psychological harm due to workplace factors. To be a part of this group, please contact us at info@servicehospitality.com. Like with physical safety, prevention is the best way to protect your employees and save money. Why this matters to our industries? 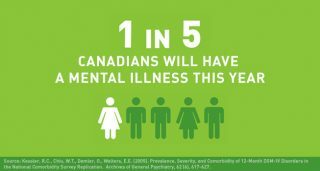 Accommodation and food services, government services, and information and culture industries have the highest prevalence of mental illness. Rates of depression are highest in industries that have the most interaction with the public or with clients. In Canada, one in five people is living with a mental health problem or illness. Those employed in the services sector are more likely to experience mental health issues. In October 2016, the Saskatchewan Government passed an amendment to the Workers’ Compensation Act, 2013 establishing a rebuttable presumption for those experiencing work-related psychological injuries. This has shone a light on the employer’s duties and responsibilities about workplace mental health. Employers have a responsibility to not only handle psychological injury claims effectively but also to incorporate mental health into the existing Safety Management System. A working group has been assembled with a mission to work together to implement best practices and positive change for mental health, safety, and claims management. Meeting three to four times annually alternating between Saskatoon and Regina, we collectively discuss practices and policies and offer training and resources to help members promote employees’ psychological health and prevent psychological harm due to workplace factors. Service Hospitality facilitates and funds these meetings and you can be a part of it! Attend information sessions and receive emails with valuable resources. There are currently over 40 employer organizations participating in this group, and growing! Eagle’s Nest Youth Ranch Inc.